Known as the "Home of Golf", Fairmont St. Andrews offers a picturesque setting on 520 acres. Perched atop a cliff overlooking the North Sea, the property offers two championship golf courses, The Kittocks and The Tonnance, as well as exclusive Five Star Alliance Perks. The 211 recently renovated guest rooms and suites have Scottish touches and luxurious furnishings, and the Fairmont Spa has a range of locally-infused treatments and relaxation therapies featuring exclusive Aromatherapy Associates products. Continue reading below the photo. Ideal for couples or families seeking more living space, Executive Suites offer separate living rooms with dining areas, lounge space, and electric fireplaces. There is a spacious bedroom for privacy, and a supreme bathroom with heated floors, walk-in showers, dual vanity units, and separate soaking tubs. Plus, there is an additional half bathroom off the lounge for guests. Learn about exclusive Five Star Alliance Perks below the photo of an Executive Suite. FIVE STAR ALLIANCE PERK: Guests booking the "5 Star Signature Package" rate or "Best Available Rate" will also receive full breakfast daily in The Squire Restaurant, $100 USD Food and Beverage credit, per room/per stay (no cash value if not redeemed in full), and a welcome amenity. As St. Patrick's Day is just around the corner, Ireland is on everyone's mind. While cities like Dublin, Galway, and Cork have much to offer, Ireland's Castle Hotels offer one-of-a-kind experiences like on-site falconries and clay pigeon shooting. Many of the estates also have formal gardens, world class golf courses, and full-service spas infused with Irish influences. Plus, the fine dining and afternoon teas at castle hotels provide travelers with the opportunity to live like royalty within exclusive settings, sure to create special memories. In this edition of Destination Spotlight, we highlight 5 Top Irish Castle Hotels offering luxe accommodations, gourmet restaurants, spa, golf, and more. Once the home of the powerful 14th-century clans of the Donegal and the O'Donnells, Lough Eske Castle is an award-winning historic hotel with a vital role in the story of County Donegal and Ireland. Set at the lake's edge, the castle hotel provides a range of accommodations options from Castle Suites with traditional elegance, the Garden Suites with contemporary styling to the stables converted into courtyard rooms with country charm. Nestled in the castle's garden, the spa offers a range of pampering, restorative, and natural treatments. Located on a private island, Waterford Castle offers the finest traditions of Ireland including a falconry where guests can schedule private experiences to fly a trained hawk above the hotel's grounds. There's also clay pigeon shooting and training available for all skill levels, archery, tennis, and croquet. Guests can stroll the Island Trails to see native wildlife such as fox, swan, deer, hare, and pheasant, or arrange for a Waterford Castle picnic basket to dine amidst the property's 310-acre island. Dating back to 1228 on the shores of Lough Corrib, Ashford Castle is one of the most luxurious castle hotels in Ireland. Once the estate of the Guinness family, guests enter the property through grand stone gates. Following an extensive refurbishment, the castle's 83 rooms, suites and the Hideaway Cottage each offer traditional elegance with custom carpets, bespoke beds, feature lighting, unique works of art, Egyptian Cotton bed linens, and the latest modern luxuries. The spa has a full-length relaxation pool with a "Tree of Life" mural, five treatment rooms, steam room, and a range of services. While the property offers four main dining rooms, afternoon tea in the Connaught Room, private wine tastings and dinners in the wine cellars, and creative Irish cuisine throughout the property. FIVE STAR ALLIANCE PERK: Guests booking the "5 Star Signature Package" rate or "Best Available Bed and Breakfast" rate will also receive full Irish breakfast daily, an 85 Euro food and beverage credit per room/per stay, complimentary green fees daily, and complimentary WiFi. Plus, this property offers exclusive 2019 FIVE STAR ALLIANCE SUITE & VILLA PRIVILEGES that can be combined with the FIVE STAR ALLIANCE PERK (if requirements are met). 2019 FIVE STAR ALLIANCE SUITE & VILLA PRIVILEGES: Guests booking a stay of 2 or more nights in a villa or suite receive lunch or dinner for two, once per stay (minimum value US $100). This offer is valid for stays of at least two nights through December 31, 2019 in the Hideaway or Presidential Suite. Originally the ancestral home of one of the few families of Gaelic Royalty, Dromoland Castle Hotel blends Old World elegance with contemporary luxuries. Guests arrive with a warm Irish welcome fit for royalty, and once settled in they can stroll the 450-acre estate to visit the walled garden, discover the falconry, row out on the lake for a picnic, or tee off on the world class golf course. There's an intimate spa with a variety of rejuvenating treatments, afternoon tea is served by a warm fireplace, and dining at the castle's flagship Earl of Thomond offers an authentic taste of Ireland amidst sparkling chandeliers, Venetian silk, and estate views. FIVE STAR ALLIANCE PERK: Guests booking the "5 Star Signature Package" rate or "Stay More Winter Rate" or "Midweek Special Rate" will also receive a full Irish Breakfast for each guest daily, complimentary airport transfer from Dromoland Castle to the Shannon Airport, and a guaranteed room upgrade at booking based on availability. 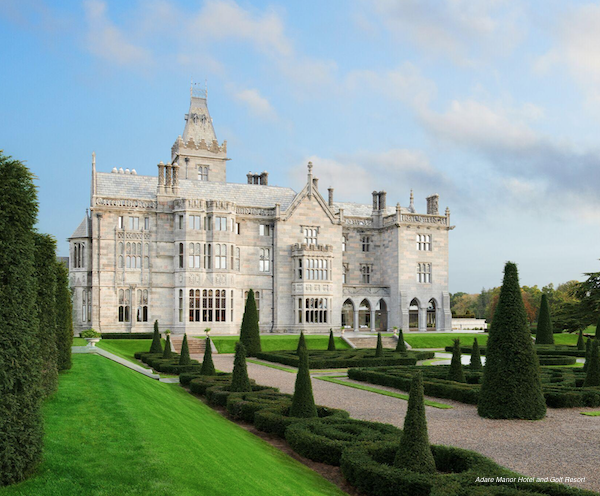 In the heart of Adare Village, Adare Manor Hotel and Golf Resort is a luxe castle hotel with a movie theater, full-service spa, championship golf, falconry, archery, and clay pigeon shooting. Amidst woodlands, walled gardens, and medieval ruins, the 840-acre estate provides guests with a world-class setting and personalized service. Taking its name from the nearby village of Adare, which is known for thatched roof cottages and antique shops, the retreat offers visitors to step back in time within a grand setting filled with the latest luxuries. FIVE STAR ALLIANCE PERK: Guests booking with Five Star Alliance receive full breakfast for each guest daily in Minstrels Gallery, and once per stay an afternoon tea for 2 guests in the Minstrels Gallery. Also, the following amenities are provided subject to availability at the time of check-in and check-out: room upgrade, early check-in, and late check-out. Steps from Il Duomo Cathedral, Brunelleschi Hotel Florence is a luxury boutique hotel in the heart of Florence. Situated within a reconstructed 6th century Byzantine tower and Medieval church dating from 1400, the property offers romantic dining in Santa Elisabetta, a seven-table restaurant within the hotel's Byzantine tower. Classic Tuscan dishes are served at Osteria della Pagliazza restaurant, and the hotel offers elegant guest rooms and suites with one-of-a-kind Florence views. Plus, this hotel offers exclusive Five Star Alliance Perks. Continue reading below the photo. Within the hotel, guests can choose from a variety of suites, including the Bargello Suite. Fully refurbished by Architect Benelli, the suite features exclusively-designed contemporary furnishings, oak parquet flooring, and views of the Santa Croce Church and Bargello. There's a living room with a stylish sitting area, 42-inch flat-screen TV with 60 digital channels, remote-controlled heating and air conditioning, and a safe deposit box. While the bedroom has a Privilege Beautyrest Simmons mattress for extra anatomic support. Read more below the photo of the Bargello Suite. One of the most unique features of the suite is the marble bathroom, which is equipped with a large Chromotherapy shower and separate whirlpool bathtub. Guests of the suite can rejuvenate in the tub or shower, then luxuriate in plush terry towels, slippers, and fine bathrobes. Continue reading about exclusive offers at the Hotel Brunelleschi Florence below the photo. FIVE STAR ALLIANCE PERK: Guests making reservations with Five Star Alliance receive full breakfast daily, a $70 USD food and beverage credit per room, per stay valid for restaurants and bar (no cash value, not valid for minibar /room service), a welcome bottle of Prosecco, and complimentary WiFi. 2019 FIVE STAR ALLIANCE SUITE & VILLA PRIVILEGES: Guests booking a stay of 2 or more nights in a villa or suite receive a one-way airport transfer per stay. This offer is valid for stays of at least two nights through December 31, 2019 in the Bargello Suite, Junior Suite, Junior Suite Executive, One Bedroom Suite, Two Bedroom Suite, Duomo Suite, Balcony Suite, Pool Suite, or Pagliazza Suite. Considered one of the safest cities in the world, Singapore offers an eclectic mix for visitors. Situated on an island at the tip of the Malay Peninsula, Singapore (officially the Republic of Singapore) is a city-state. For centuries, its location made it a natural meeting point on sea routes, which was a popular destination for Arab dhows, Portuguese battleships, Chinese junks, and Buginese schooners. Today, Singapore is "The Lion City" with its name coming from the Sanskrit words "simha" (lion) and "pura" (city). Modern Singapore was founded in the 19th century by Sir Thomas Stamford Raffles. After being ruled by various nations, Singapore became an independent country in 1965. Travelers to the city-state will find an array of multi-cultural influences, as well as preserved pieces of the country's colonial and wartime past. Visitors interested in history will want to take a walk along the heritage trail for a real trip through time, while visiting monuments, museums, and memorials along the way. Throughout the year, Singapore hosts a variety of events including the Singapore Jazz Festival, Neon Lights: a three-day event with music, creative workshops, and art installations, as well as Asia's largest outdoor beach party ZoukOut. Visitors to the city may want to begin the day at the Botanic Gardens for tai chi amidst rainforest trees, check out a cricket match at Padang, or step back to colonial days at the Supreme Court. Sentosa Island is a popular destination for outdoor recreation, the Sri Mariamman Temple showcases the city's spiritual side in Chinatown, and the Chinatown Night Market is a known for stalls filled with red lanterns, Chinese calligraphy, and traditional clothing. For those that like to shop, Orchard Road is the spot for designer fashions and the latest electronics, Demsey Hill is a haven of antique stores, and Haj Lane in the Arab Quarter has bold textiles and tailored dress shirts. Featuring floor-to-ceiling windows in all guest rooms and suites, Andaz Singapore is a modern urban retreat. The rooftop outdoor pool has incredible views, there are four dining options including Alley on 25 with a street-dining-inspired menu on the 25th floor of the hotel, and the destination bar Mr. Stork on Level 39. For visitors with a love for sweets, Pandan puts a spin on Singapore's national cake, the pandan chiffon. FIVE STAR ALLIANCE PERK: Guests booking the “5 Star Signature Package” rate will also receive full American breakfast for each guest daily in Alley on 25, $100 food and beverage credit, per room/per stay (not combinable, not valid on room rate, no cash value if not redeemed in full), and a welcome amenity. Home to one of Asia's largest spas, the Fairmont Singapore provides an idyllic location in the heart of downtown. Featuring 15 distinctive restaurants and bars, guests can choose from a variety of dining options from casual to fine dining, authentically local or international. Set at the crossroads of the central business district, world-class shopping and entertainment, the hotel is located above the City Hall Mass Rapid Transit (MRT) train station. FIVE STAR ALLIANCE PERK: Guests booking the "5 Star Signature Package" rate will also receive daily full breakfast for two, $50 food and beverage credit, per room, per stay, and complimentary internet access. Home to one of Asia's finest private collections, The St. Regis Singapore offers unsurpassed luxury, with signature St. Regis Butler Service available any time of the day or night. The landmark property is situated at the crossroads of the embassy district, prime shopping along Orchard Road, and the UNESCO World Heritage Site of the Singapore Botanic Gardens. Guests can relax at the Remede Spa, dine at Brasserie Les Saveurs, LaBrezza, or Yan Ting, and sip a cocktail at the Astor Bar. FIVE STAR ALLIANCE PERK: Guests booking the "5 Star Signature Package" rate or "Best Available Rate" will also receive full breakfast for two daily and a $100 USD food and beverage credit per room/per stay. This luxe city resort is located amidst a tranquil setting with 15 acres of lush gardens and a large free-form pool. Guest rooms and suites at Shangri-La Hotel Singapore are situated within three distinct wings. Family-themed rooms are available with an array of dedicated family-focused amenities, plus there are 11 restaurants and bars. Singapore's first Chi, The Spa is located within the hotel, and the designer shopping malls along Orchard Road are steps away. FIVE STAR ALLIANCE PERK: Guests booking the "5 Star Signature Package" rate will also receive daily full breakfast for two, $100 USD Hotel Credit per room, per stay valid for food, beverage, and spa (excludes room service and minibar), Welcome Chinese Tea and Fruit in room. Subject to availability at time of check-in/departure: room upgrade, early check-in, and/or late check-out until 4 PM. Showcasing Marina Bay and skyline views, Mandarin Oriental Singapore has a prime waterfront location with an outdoor swimming pool, private cabanas, and contemporary wet deck. There is a wide range of dining options on-site including Morton's the Steakhouse, Teppan-Ya, MO BAR, and Cherry Garden. While [email protected] has an exclusive setting for cocktails and sunset views. FIVE STAR ALLIANCE: Guests booking the 5 Star Signature Package rate will also receive daily international breakfast buffet for two at Melt Cafe, $100USD Food & Beverage or Spa Credit, oner per room, per stay (except Morton's Steakhouse & Teppan-Ya), welcome chocolates, and WiFi. Based on availability at booking, a room category upgrade (upgrades are up to City Suite tier), and subject to availability at check-in/check-out: early check-in and late check-out. Fresh off a renovation of all of the property's 94 cottages and suites, Carneros Resort and Spa is offering a Fourth Night Free* Promotion. Available on all accommodation types, guests booking a stay at the property from April 1 to August 29, 2019 can stay four nights for the price of three nights. This offer is valid for bookings made February 1 to August 25, 2019, and is subject to availability. Rate varies by accommodation type, date of travel, and season. Read more about the property and an exclusive Five Star Alliance Perk below the photo. Carneros Resort and Spa just completed a renovation of its cottages and suites, which range from 400 square feet of living space and up to 800 square feet of indoor and outdoor living space. Inspired by nature and wine country living, Oakland-based Nina Chiappa Interiors refreshed the accommodations with warm wood tones, refined rustic furnishings, light grey-toned wood grained flooring, and botanical fabrics. While the farmhouse theme is infused in contemporary lighting made of blackened iron and a tree slice end table. French doors have been replaced by glass bi-fold doors in many of the cottages for a seamless indoor-outdoor living area. There are outdoor gas fire pits in all cottage and suites, plus add-on amenities like portable mini-projectors and telescopes for backyard movies or stargazing. Learn about an exclusive Five Star Alliance Perk below the photo. FIVE STAR ALLIANCE PERK: Guests making reservations with Five Star Alliance will receive complimentary full American breakfast for two daily at Hilltop Dining Room (a maximum of $60 credit per room, per day) and a $100 spa credit, per room/per stay. * Offer is valid for bookings made February 1 to August 25, 2019 for stays at the resort from April 1 to August 20, 2019. Rate varies by accommodation type, date of travel and season. Subject to availability and currency rate fluctuation. Valid on new bookings, not combinable with any other packages or promotions. Paris is always a good idea, and the Duplex Terrace Eiffel View Suite at Shangri-La Hotel Paris takes luxury to a new level. The bi-level suite provides two floors of elegant living space including a spacious living area, mezzanine, high ceilings, chandelier, and 2-story high windows that open to a one-of-a-kind private terrace featuring breathtaking views of the iconic Eiffel Tower. Continue reading below the photo of the Duplex Terrace Eiffel View Suite. Within the suite there is a spacious living area with Eiffel Tower views, natural wood furniture, and marquetry--French clear-cut shapes and symmetrical designs. There's a full-size executive writing desk, a plush bedroom with a Shangri-La signature bed and bedside lighting controls. While the marble-clad bathroom has a heated floor, flat-screen TV, mist-free mirror, large walk-in shower, and separate soaking tub. Plus, 24/7 Shangri-La service. Formerly the home of Napoleon Bonaparte's grandnephew, Prince Roland Bonaparte, the Shangri-La Hotel Paris offers old-world elegance, and a regal setting with commanding views of the Eiffel Tower and River Seine. The hotel's Shang Palace earned a Michelin Star for its Cantonese cuisine, and the property's French gastronomic restaurant L'Abeille was awarded two Michelin stars. Learn about an exclusive Five Star Alliance Perk below the photo. FIVE STAR ALLIANCE PERK: Guests booking the "5 Star Signature Package" rate will also include full buffet breakfast for each guest daily in “La Bauhinia”, an 85 Euro hotel credit per room/per stay (not valid for room rate and no cash value), and VIP amenities including a bottle of Champagne upon arrival. Additionally, bookings for the Deluxe Suite Category and above also receive a one way airport transfer with VIP Meet and Greet upon arrival.